Liberty, one of the UK's most prominent and influential civil liberties groups, will send legal observers to the TUC's national march on Saturday to monitor protesters as well as the police. This is sadly the latest sign the group has been co-opted by the very establishment it was created to hold to account, argues Sam Walton. The civil liberties organisation Liberty will provide their brand of legal observers on October 20 for the latest TUC-organised march against the cuts. They will not only monitor the police, but also protesters – much like a special (volunteer) constable would. However, experienced legal observers have pointed out three main problems with Liberty’s plans for this Saturday: their volunteers are not independent, they are monitoring protesters and they do not know what they are doing. Liberty have a proud history of legal observing since the 1930s, but unfortunately it is just that – history. They no longer legal observe regularly, and have forgotten both how to do it and why it is needed. This is part of a wider trend in recent decades of Liberty moving further and further away from the grassroots organisation it was as the National Council for Civil Liberties. Instead, it now seemingly concerns itself solely with undertaking a bunch of interesting liberal legal challenges, but it has lost all touch with what is happening on Britain’s streets. It has become lobby group for liberal lawyers, run by lawyers, and focusing on issues lawyers are interested in- not a grassroots civil rights movement. Grassroots legal observing groups such as the Legal Defence & Monitoring Group, Green & Black Cross, Newham Monitoring Project and Haldane, all work closely together on the hundreds of other protests throughout the year which do not have the glamour of a national march. They support those unfairly targeted by police all year round. However Liberty seem to believe their high profile and history mean that they know more than these groups. They have repeatedly failed to communicate with other groups, who recognise the need to work together and will themselves be running their own large joint team of experienced legal observers on October 20. Worse still, Liberty’s know-it-all attitude and ignorance of recent protests has meant they have been spectacularly co-opted by the police. On the last anti-cuts demo in March 2011, Liberty praised the police for their ‘proportionate and restrained’ behaviour, but had no bad words about either of the two major incidents on the day – the unprecedented mass arrest of 145 people inside Fortnum & Mason and the kettling of protesters in Trafalgar Square when night fell. Liberty had someone in the police control room that day, and could have shone a vital light on the reasoning (or lack of) behind the police’s aggressive actions. Instead, they said nothing. This could be because they were focused almost totally on the TUC march, but also because their legal observers were all told to clock off at 5pm. Anyone with a modicum of experience of recent big protests knows the police usually become more aggressive when night falls, especially as it is harder to film their actions. But by this time, Liberty had gone home. It is a fundamental principle that, because of the huge imbalance of power between individuals and the state, legal observers should monitor the police and only the police. The police have more than enough resources to monitor protesters without help from outside. The role of legal observers is to hold the police to account when they act aggressively and unlawfully. Within an adversarial legal system where alleged offences by protesters against police officers are investigated by the police, it is essential that there is evidence gathering from another source, one not working with the prosecution, so that a defendant’s right to a fair trial is preserved – a basic legal position that an organisation like Liberty should be familiar with. The independence of legal observers is also extremely important, not only for their credibility but to ensure their safety. 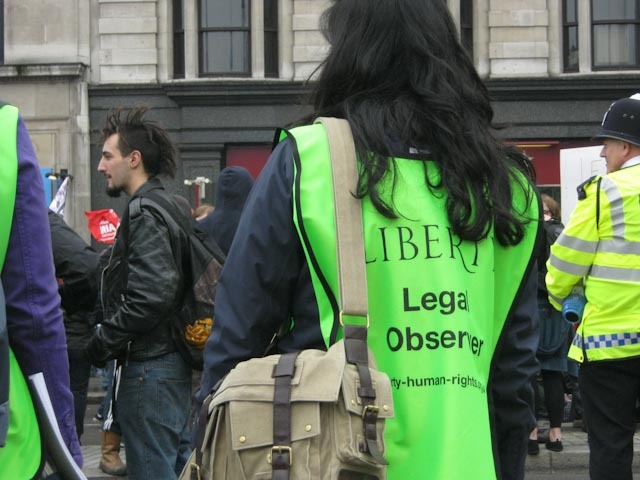 Liberty’s volunteer legal observers passing on information about protesters to the police, just like special constables, potentially puts all legal observers in danger. It is a shame that an organisation with a history such as Liberty’s has seemingly lost its way. They need to stop collaborating with the police, regain their independence, and start talking to legal observing groups who understand police tactics and have substantial and valuable practical experience. Liberty do not know what they are doing, and in their arrogant blundering are doing more harm than good. Excellent article Sam. For me the co-option of Liberty was perfectly illustrated by the events of the opening night of the Olympics. Boyle chose to honour Liberty by inviting Shami Charkrabarti to be one of the six bearers of the union flag. Meanwhile, the police were conducting a mass arrest of the Critical Mass cycle ride. When the eyes of the world were on Liberty, when anything they might have said would have had maximum impact, they chose to say nothing. It does rather look as if their acceptance into the establishment has very effectively bought their silence. Great piece Sam. As the above comment goes, the issue with Liberty unfortunately expands far beyond their ridiculous approach to legal observers. My experience with the organisation has certainly reflected this and often made me wonder what on earth they are about. Two words: sold out. Absolutely agree. It must feel quite strange to Liberty to be more popular with the political establishment than with political protesters – I hope it feels strange anyway. The incident in Trafalgar Sq after the TUC demonstration was not just a kettling but a violent clearing of the square when the police had decided they had had enough of the protesters (using the excuse of an incident at the olympic clock). Of course, the protesters were not by then ‘legitimate’ protesters in the eyes of the police, since the ‘legitimate’ demo had ended and that was the ‘wrong place’ to be. But Liberty needs to think VERY carefully about whether they buy into the police’s (and politicians’) discourse of legitimate and illegitimate protesters. Their failure to think any of this through from a genuine civil liberties stance is a disgrace. Hmmm. There’s a danger isn’t there, when an organisation gets big – too big for its boots? Not only becomes part of the establishment but decidedly not of the grass-roots, if ever NCCL or Liberty started out there. I’ve been in the position (twice) of having to organise events when someone had the bright idea of inviting someone from Liberty. Once was after a Liberty spokesperson gave a verbal agreement to speak at an event. I mean, I know they are busy and all but you would think that there’d be a response from a letter, email and phone call all saying ‘thank you for agreeing to speak at…’, even if it was only ‘I never said I could/would speak’ or ‘sorry can’t do it’. But no. Not a dicky bird. So impolite! Trying to get Shami Charkrabarti to speak gets a deadly silence. So unless you’re representing an organisation of the size of CND or STWC, I’d say don’t bother. Find a small grass-roots group instead.